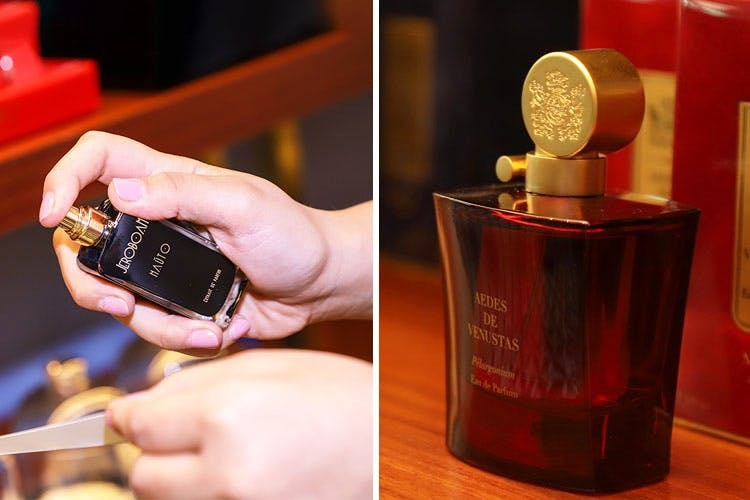 Fort has recently opened its gates to a niche perfumery, Scentido, brought to the city by Shishir Mehta who has personally and carefully curated rare perfumes that adorn the shelves of this boutique store. India’s very first niche perfumery, Scentido, has brought to town a super exclusive collection which includes Roja Parfums, Escentric Molecules and Ormonde Jayne from the UK; Berdoues, Jeroboam and Jovoy from France; Gabriella Chieffo from Italy amongst others. The latest addition to their already spectacular collection is Berdoues – fragrances that are inspired by the exotic ingredients found in the lands of Russia, Brazil, Japan, India, and South Africa. Their Assam of India fragrance takes you to the tea plains of Assam. The Maasai Mara, South Africa is a balmy blend of subtle honey and spices. While the Russkaya Kozha, Russia is an elegant leather perfume, Selva Do Brazil is a simple pick that will evoke the smell of the Brazilian forests. And no points for guessing that the one inspired from Japan, Somei Yoshino, is all about cherry blossoms. So what are you waiting for? It’s time to pull out all sorts of cards to swipe at Scentido to bring back a part of a legacy. What you wear is a part of your identity. So it makes all the sense to be picky about it to choose nothing but the best. If you're planning a gift for that special someone or your bestie, this'll make for the perfect surprise.